How did you first learn about post-graduate service? I was unlike most of my peers in my program, I had applied for post-graduate service positions three and half years after college. Perhaps there were opportunities of service at college, and if so I probably would have ignored them as I wasn’t ready for it yet. While in college, I had a desire to develop an imitate relationship with God through silence and solitude. How to pursue that was a complete mystery to me. After college I worked as a video editor in D.C. for three years. During this time I grew tremendously in my faith and the longing to be in a imitate relationship with God resurfaced. Again, I didn’t know how to do this. I overheard a peer say she was going to teach English aboard. That resonated with me, but I had many doubts. Somehow, I found myself in a bar with a Franciscan friar from my parish. When I told my plans and concerns about teaching English aboard, he suggested I do missionary work. The thought never occurred to me, but it resonated deeper than teaching English aboard. In addition, he suggested I search the Catholic Volunteer Network, where I found the Salesian Lay Missioners. What other options were available to you, and why did you choose to serve with Salesian Lay Missioners? Having sought missionary service after college, I don’t know what was available to me during my undergraduate. Several years after college, I had applied to two language programs. One was the Language Corps, and eventually I turned them down because I wanted to a missionary and have my abroad experience to have spiritual foundation. When I came down to it, there were two programs: the Salesian Lay Missionary and the Passionist Volunteers. The Salesian Lay Missioners stuck out as I went to a Salesian college, though I didn’t know what that really meant. When I began to apply with them, more things began to click. While completing my application, I serendipitously met a former missionary from the Salesian Lay Missioners, who gave me complete confidence in the program. In meeting the organization with other potential candidates in a “discernment weekend,” I walked away with hope, love of their devotion to Mary and their mission to the youth and trust in God’s will. 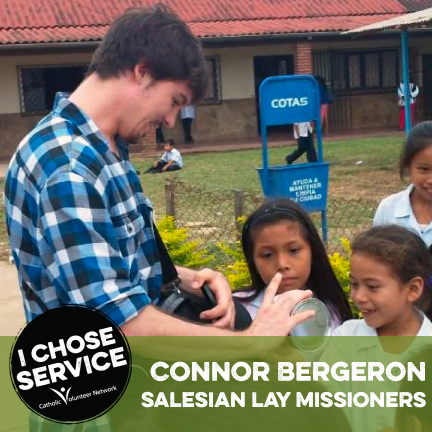 In addition, the Salesian offered a mission site in South America, where I wanted to go. They fraternity was encouraging, and they seemed to have a solid system to help while we were in the thick of mission life. What was your service experience like? When I left my video editing position to serve as a missionary in Bolivia, I didn’t know what kind of work I’d be doing. There seemed to be a wide-range of tasks, and because of the Salesian’s charism is to the youth, teaching would probably be my labor of love. However, about two months before I flew to Bolivia my mission site was change. I was still going to Bolivia, but another site, Yapacaní. Yapacaní, was where I would serve for a year in Bolivia. God is mysterious and quite funny, because I would learn that my main priority would be at the Salesian owned radio and television station in Yapacani, called Radio Televisión Ichilo. There I directed a cooking show and a young adult show, as well record coverage for nightly news, edit commercials and train their editors on advanced techniques. In addition, I translated more than 900 letters from the youths in the village who were sponsored by the Canadian charity Chalice. Thirdly, I taught weekly religion for 1st-6th grade as well as high school catechism. Lastly, I did whatever was asked of me, which included painting images for churches and chapels, serving lunch to the homeless and visiting the sick. What benefits have you gained from this experience that you might not have received otherwise? Every challenge brings opportunities for growth. That being said, there were many challenges in my mission experience, and as a result I’ve found many blessings. An obvious one is my grasp of the Spanish language. Before I retained some fragments from high school, and having been forced to speak Spanish daily (no matter how broken and silly I sounded) it humbled me. It has also benefited me at my current position at the Arlington Catholic Herald, where I frequently write stories for our Spanish page, covering events and topics in the Hispanic community. My prayer life became more disciplined as I lived with Salesian priests and watched their dedication to their parishes and vocation to the priesthood. My love for the Bolivians, Latinos and all people grew. I learnt that when our loved ones or peers or a stranger is suffering we may not have any readily available advice or relief to give. In those occasions, we can love by being simply present and listening. Within my prayer life I became aware of how little I trusted in God, and depended upon myself. As I began to throw myself at His mercy, I realized how much I needed to stop talking over God, and listen. One of the greatest gifts that I’ve gained from mission was a fiancé. No, I didn’t propose to a native, but I met a beautiful woman in the States months before mission. It was difficult to depart after starting a relationship. I’m happy to say, that we managed to grow, stick out a long distance relationship and be married soon! What advice do you have for someone considering post-graduate service? My advice for someone considering post-graduate service is to pray. Missionary life is phenomenally rewarding and arduous. Having a regular commitment to Our Lord in prayer will help sustain you in those difficult moment and give reasons to be joyful. While searching for a program, ask yourself, “What do I want? What does God want? What will make me authentically happy (aka a saint)?” Then pray, “God, mold me into the man/woman you so long for me to be.” Hopefully, this will guide you to find what kind of mission work you’re being called. God won’t put Africa in your heart if you dread going there. He’s wants you to be happy, we just need to be willing to listen. He knows us better than we do ourselves. Once you’ve found your program and site, do plenty of research: what does the US State Department say about this country? What preventive shots do I need? (bring tons of probiotic pills), how will I stay in touch with family/friends? And set some realistic expectations. And just trust in God.